Chinese medicine is the oldest continually practiced medical system in the world that is still widely used today. 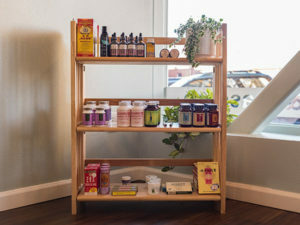 Due to its relatively low cost and minimal side effects, Chinese Medicine has become a highly popular method of health care in the United States. When hearing about Chinese medicine, most people are familiar with acupuncture but don’t realize that acupuncture is just one part of a unified, holistic health care system that developed in China over 2,500 years go. 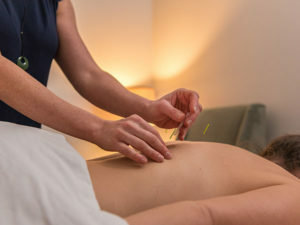 In addition to acupuncture, herbal therapy, moxibustion, dietary therapy, massage and qigong are also considered essential components of the medicine. Acupuncture refers to the use of hair-thin needles inserted in specific places throughout the body, called acupuncture points. There are approximately 300-400 primary points and hundreds of extra points. These points are grouped along certain pathways, known as meridians. Health is disrupted and pain or illnesses manifest when the energy flow through these pathways is absent, deficient, interrupted, excessive, or blocked in any way. The acupuncturist is able to reestablish balance by accessing the organ systems through points selected along the meridians. By stimulating the appropriate acupuncture points the energy (known as Qi) is released and regulated, and health is restored. There is mild to no pain associated with the insertion of the needles. Most people find acupuncture to be a painless, deeply relaxing experience. Tuina massage: A Chinese style of body work that utilizes massage, traction and stretching to target imbalances in the body. It is especially useful for treating musculoskeletal diseases, and is used to relieve muscle spasms, realign musculoskeletal structures and to promote recovery of muscles, bones and joints. Click here for more information on Tuina massage. 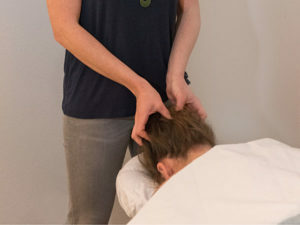 Sotai: A very gentle style of Japanese massage that uses regulated breathing with gentle movements to realign postural imbalances in your body. These movements “re-train” the nervous system and muscle memory to restore health, balance, and ease to the musculoskeletal system. This style of massage is great for those who have general body ache or chronic pain. Chinese herbology is a safe and effective way to improve many health conditions, and is especially powerful when combined with acupuncture. Chinese herbs are particularly useful for conditions involving internal organ conditions, including female reproductive disorders, headaches, insomnia, digestive disorders, body temperature imbalances, fatigue, chronic illnesses, low immunity, and colds & flus. Chinese herbal formulas used in combination with acupuncture treatment can dramatically speed up the progress of treatment. In your acupuncture session, Katy will develop a detailed diagnostic pattern of disease based on your signs and symptoms. After a diagnosis is made, you will be given an individualized herbal formula tailored to your unique situation. Cupping is a therapy used to improve blood circulation and regulate the nervous system. It is commonly used for most types of musculoskeletal pain, increasing immunity, getting over the flu and colds, fatigue, cellulite control and weight reduction. A flame is briefly inserted into a glass cup, which is then placed on the patient’s body. The cup is only slightly warm to the touch, but the lack of oxygen in the cup creates a vacuum like suction causing the skin and superficial connective tissue layers to be pulled upwards into the mouth of the cup. How does it work? The lymphatic system, which is closely linked with the immune system, helps to clear the body of harmful metabolic waste products. Cellular nourishment and efficiency depends on how fast and how completely waste material is removed from the extracellular fluid. 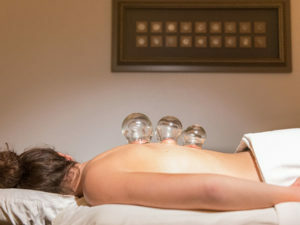 The suction of the skin caused by cupping forces fresh blood, qi and lymphatic flow to the area which “flushes out” the metabolic waste and toxins. Cupping often causes a temporary discoloration of the skin that can resemble a bruise. Even though the area may look like a bruise it does not generally hurt. After cupping, it is important for the patient to keep the affected area covered from the cold and wind. “When a good attitude and sufficient exercise are combined with a balanced and disciplined diet, one finds no limit to health”. Diet is an essential pillar of health in Chinese Medicine. In 1988 the Surgeon General of the United States acknowledged that two-thirds of all deaths are directly affected by improper diet, and poor eating habits play a large part in coronary heart disease, stokes, atherosclerosis, diabetes and some cancers. In addition, poor lifestyle choices can contribute heavily to a myriad of health problems such as insomnia, ADHD, gastro-intestinal problems, thyroid dysfunction, fatigue, low immunity, acne, infertility, and so much more. According to Chinese Medicine, foods have different therapeutic properties and actions to create harmony and balance in the body. Food therapy can be much slower to take effect, but it has a very profound, lasting effect on all systems of the body. With adequate exercise and a nutritious diet, one can save so much time, money and suffering by reducing trips to the doctor’s office and the need for pharmaceutical drugs. 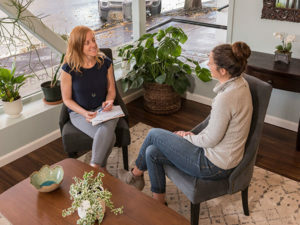 At Corvallis Acupuncture and Wellness Center, Katy can tailor an individual dietary and lifestyle plan to alleviate your specific symptoms or to work as preventative medicine by supporting your individual constitution. A very soothing and nourishing heat therapy in which the mugwort herb is safely burned above the body. The herb may be placed directly on the skin, held close to the skin for several minutes, or placed on the tip of an acupuncture needle. Practitioners often do both acupuncture and moxibustion in the same clinic session when appropriate to the diagnosis and treatment strategy. Practitioners believe that the therapies increase each other’s effectiveness when used together.